Flax is a blue flowering crop grown on the Prairies of Canada for its oil-rich seeds. There are two types of flax seed, yellow (or golden) and brown, and their nutritional profiles are very similar and both contain the same number of short-chain omega-3 fatty acids. While brown flax seed is edible for humans, it is more typically used in animal feeds because of its tougher texture. Golden flax seed is widely considered to be the best variety for human consumption. Canadian golden flax seed is grown primarily in the clean prairie provinces of Saskatchewan, Manitoba, and Alberta. Canadian golden flax seed is some of the finest worldwide. Flax seed benefits have been well known by some for centuries, but only now are the medical community and the health food advocates focusing on its many positive health benefits. Because of its beneficial effects on numerous aspects of health, flax seed is fast becoming a new food in many diets. Flax seed is an excellent source of omega-3 fatty acids, dietary fiber, lignans, micronutrients, antioxidants, manganese and Vitamin B1; modern research has found evidence to suggest that flaxseed can also help lower the risk of diabetes, cancer, and heart disease. Flax seed is one of the richest sources of lignans (0.3 g per 100g), a type of phytoestrogen which may protect against cancer, particularly hormone-sensitive cancers such as those of the breast and prostate. Flaxseed Lignans are found in the hulls of the Flaxseed. The main Lignan in Flaxseed is Secoisolariciresinol Diglucoside (SDG). After ingestion, SDG is converted by intestinal bacteria to the mammalian lignans enterodiol and enterolactone. These two mammalian lignans mimic estrogen and attach to estrogen receptors. Plant estrogens have a weaker estrogenic effect than normally occurring (endogenous) estrogen. In men the plant estrogens block the conversion of testosterone into DHT. DHT drives both hair loss and the growth of prostate cells. Men have experienced increased hair growth. Women have experienced mitigated menopausal symptoms. The transformation of lignans by intestinal bacteria is essential to be protective against certain chronic diseases, such as cancer, cardiovascular disease (CVD), osteoporosis and menopausal symptoms. SDG metabolites may also protect against CVD and the metabolic syndrome by reducing lipid and glucose concentrations, lowering blood pressure, and decreasing oxidative stress and inflammation. Flax lignans may also reduce cancer risk by preventing pre-cancerous cellular changes and by reducing angiogenesis and metastasis. Flax lignans may also have a therapeutic role in chronis autoimmune diseases by modulating the immune system. Thus, dietary SDG has the potential to decrease the incidence of several chronic diseases that result in significant morbidity and mortality in industrialised countries. that these fatty acids are required for proper infant growth and development. Cholesterol can be reduced by adding flax seed to the diet. New research also suggests that alpha-linolenic acid, an omega-3 fatty acid which is abundant in flaxseed, offers protective effects against both coronary heart disease and stroke. Omega-3s have been shown to also protect against hypertension, and inflammatory and autoimmune disorders. Flax seed contains both soluble and insoluble fibre. Most of the soluble fibre in flaxseed is mucilage, a thick, sticky substance. Soluble fiber dissolves with water and creates a gel-like substance that helps to lower blood cholesterol and glucose levels. Studies show that the insoluble fibre in flaxseed, like that in wheat bran, is helpful for regulating bowel movements and preventing constipation and diarrhea. Flaxseed’s insoluble fibre components have the capacity to hold water, they help soften the stool and allow it to move through the colon more quickly. when eaten whole, is more likely to pass through the intestinal tract undigested, which means your body doesn’t get all the healthful components. Ground flax seeds are a little easier for your body to digest than whole flax seeds so if you purchase the whole seeds, you need to grind them up to get the benefit. But even though you grind them, they are still hard to digest. We’ve had some people ask about the sprouted flax seeds. Water is the key ingredient in sprouts. Basically soaking and rinsing the seeds will remove its enzyme inhibitors and the seed will begin to germinate. In this process all of the resting nutrition in the seed will begin to break down into its simplest components. But soaking flax seeds and then sprouting them eliminates the medically beneficial compounds that are found in flax seeds. So we do not recommend you to consume them in their sprouted form. There is a bigger, scarier problem. Ground flax seed must be preserved in a dark container and kept in a cool temperature. Because, immediately after flaxseed has been processed the interior of the seed is exposed to air and the process of oxidation begins. Oxidation quickly destroys the medically beneficial compounds that are found in flax seeds. Then, what is the best way to eat flax seeed? The very best way to experience falx seed benefits is to consume them in their fermented form. Fermented flax seeds contain beneficial probiotics, digestive enzymes, health boosting nutrients, and the medically beneficial bioactive compounds. Digestion is a complex process which relies on many factors and steps to transport and use the food you eat to absorb into your body. Bioavailability, bioactivity and health effects of flax seeds are strongly determined by the intestinal bacteria of each individual. Fermentation is the enzymatic decomposition and utililization of foodstuffs, particularly carbohydrates, by microbes. Fermentation takes place throughout the gastrointestinal tract of all animals, but the intensity of fermentation depends on microbe numbers, which are generally highest in the large bowel. Thus, the large intestine is quantitatively the most important site of fermention. Believe it or not, the fermentation process can start even before you put flax seeds in your mouth. Flax seeds can be optimally fermented by natural enzymes and naturally occurring beneficial bacteria. 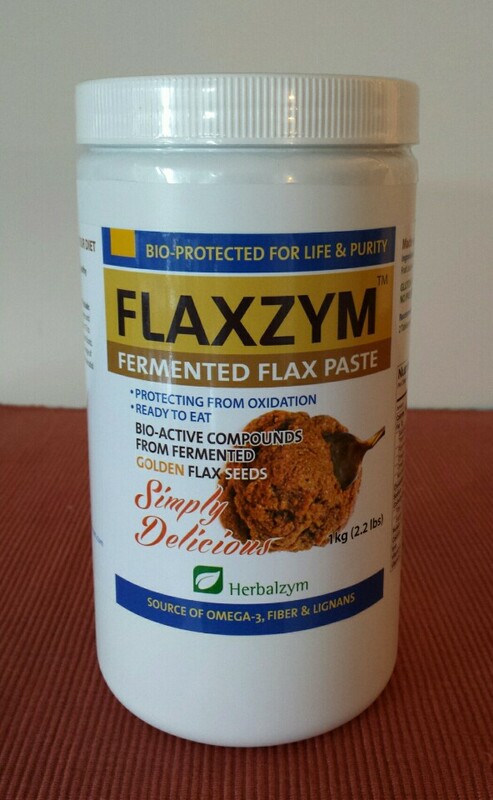 Flaxzym™ is the one and only fermented form of flax seed. Flaxzym™ is made with 100% Canadian golden flax seeds and well protected from oxidation.